Here are some photos that were sent in to us. Do not send your questions or comments regarding these photos to S.P.A. If possible, direct all inquiries to the photographer. Thank you. 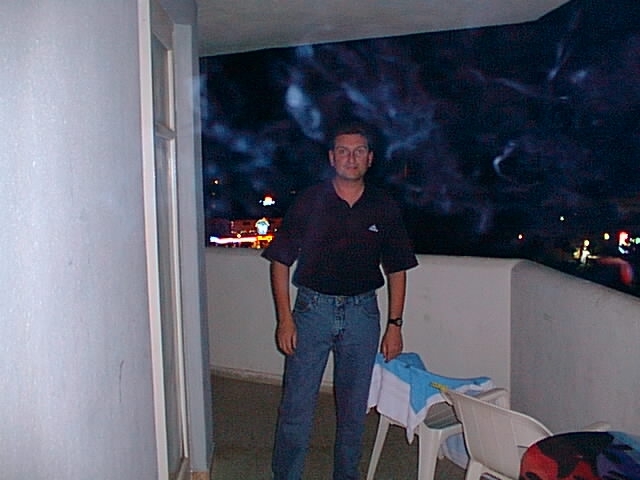 Photo taken by Martin Dann This photo was taken on 13/10/99 on a balcony of a hotel in majorca. It was taken with a sanyo digicam G200e,we thought it was very strange as you can see ther is mist surrounding my friend with what looks like an image over his left shoulder,what do you think? Majorca is one of the Spanish islands and the photo is real,i still have the original photo on my camera because so many people want to see it. PS The photo taken with in a minute after the spooky one, in exactly the same place was crystal clear no mist or aura,weird. Hi my name is Tim Mills and I live in Northern Kentucky. 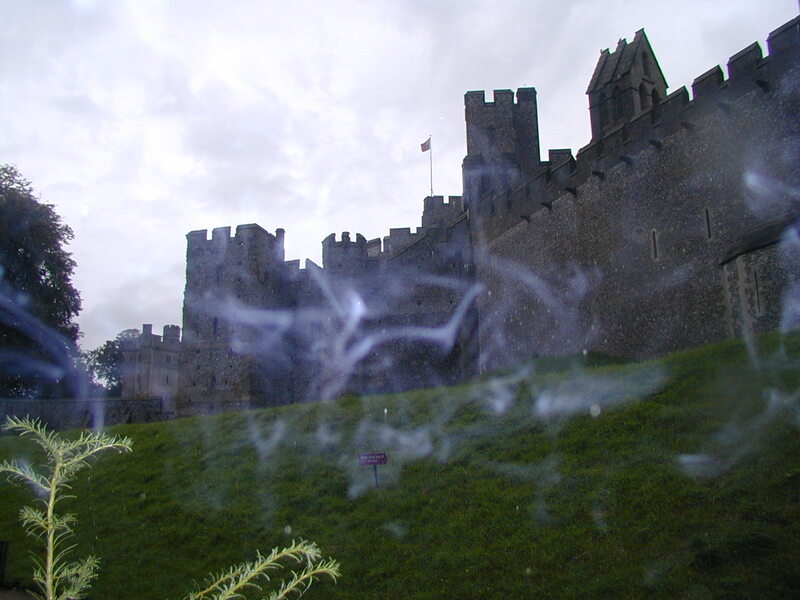 Recently I was on a business trip to Europe and found some time in Arandel England near the English Channel. I went to the Arandel Castle for a tour and on the way up the lane I took a picture with an Olympus digital camera, I walked a few hundred yards and took another, then another. I took the tour and came out went back to the hotel and downloaded my camera to my laptop. I was astonished to find that my second picture taken just minutes after the first had these weird white streaks through the photo, all the rest were fine on the camera,(15) of other things. I was by myself when I took the picture, I am using an Olympus C-2000 Z camera. The first picture was just to show that the camera was working properly, the second picture was taken about 2 minuets after that, a third after that it was fine also. I did not see anything while taking the picture only after downloading it on my laptop back at the hotel did I see it. I don't know why I stopped to take the second picture I just thought it would be nice to get that side of the castle before I went in for the tour. They did not allow pictures from inside. If you look closely you can see white balls coming up from the ground. Yes, you can post it and if you need any other information just let me know. The man leaning on the wall (top, left) was not seen by the others in the room. 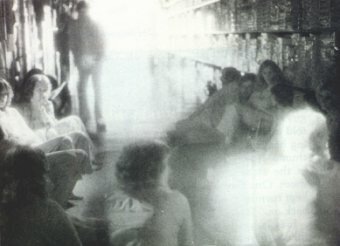 This photo taken at a haunted Toys R US in Sunnyvale, CA. You might have seen this case on the television show UNSOLVED MYSTERIES. Photographer unknown. We know that this photo was taken with a 35mm SLR with infrared film. As far as we know this photo is free domain. If it is otherwise, please contact us. THE NAME OF THE PHOTOGRAPHER, ORGANIZATION, TIME & DATE (IF POSSIBLE), CAMERA TYPE (35MM, DIGITAL, POLOROID W/ FLASH? ), FILM SPEED, NAME OF AREA, WEATHER (IF NECESSARY).